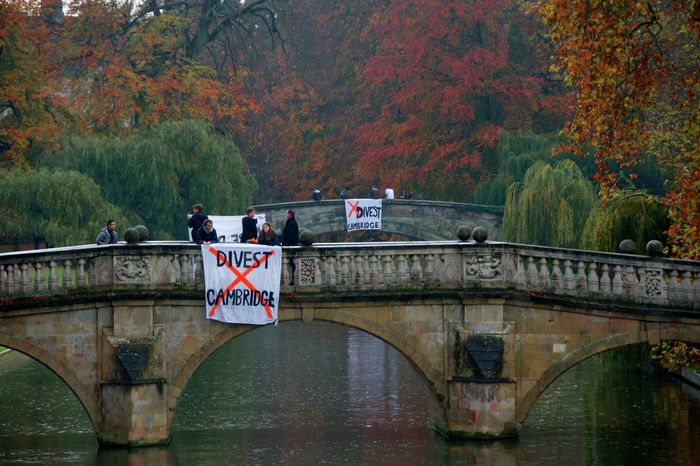 “What should Cambridge do next?” It is a question at the heart of debates over divestment, University links with arms companies and ongoing access failures. Perhaps surprisingly then for an institution that has seemed reluctant to act on the concerns of students and staff, it is also the question asked in the new video promoting the university’s £2bn philanthropy campaign. You have to give it to the video creators. Featuring beautiful interviews with famous faces such as David Attenborough, Stephen Fry, Clare Balding and George the Poet, it portrays a world leading, progressive institution, aware of the responsibility it has to the world and ready to adapt and change. The sleek website for the campaign - ‘Dear World… Yours, Cambridge’, is similar, focusing on the “new and daunting challenges” that “our planet faces”, with an emphasis on how Cambridge University’s “ideas and insights are needed to solve them”. It is a nice prospect and a great marketing campaign. However without action to follow up these bold claims it is just that: another spin victory for Cambridge. Cambridge University is undoubtedly a world leader and its researchers have contributed a great deal to society. From numerous Nobel Prize winners to small scale initiatives such as Learning Together, a program run by two criminology professors that has had transformative effects on the lives of prisoners and students alike, it would be crazy to argue that Cambridge has not contributed to the world in many positive ways. I don’t doubt Vice-chancellor Stephen Toope’s sincerity when he claims in the video that he wants “Cambridge to be a university that does not only reflect the society it serves but one that makes it better”. He claimed in a meeting with student representatives in April that in his self-described “servant leadership role”, he has little power to change things because he lacks authority over those in the University who do not report directly to him. Even though this was a questionable claim, it’s a fact that the entrenched traditions and institutional power of colleges mean that the issues the University faces extend beyond the highest level of management. However, we must consider whether the University’s current actions demonstrate this commitment to improving society beyond the scope of its marketing strategy. The University has an estimated £337m invested in fossil fuel industries, while colleges hold around £20.7m, plus £6.5m in investments in arms companies. Meanwhile colleges pay hundreds of staff under the Living Wage in one of the most expensive cities in the UK. Taking one example: as of this summer Freedom of Information requests revealed that, King’s College, renowned for its comparatively left-wing values, paid 114 workers below the Living Wage, while spending an estimated £19,498 on wine. It is telling that when the University website titles a section “enhance our environment” they discuss the collegiate system, libraries and museums, not facing up to their own impact on the environment through links to fossil fuel companies. To take just one example, engineering freshers were presented with data booklets sponsored by Shell this year. When the marketing video features the much loved David Attenborough discussing how “the generation of energy… has caused so [many] problems with the production of carbon dioxide”, there is unsurprisingly no mention of the University’s investments in fossil fuel companies. After all, this is a “small investment fund”, as Toope said in an open meeting with staff and students earlier this year, but one that proponents of divestment claim is large enough to be able to pressure some of the world’s largest companies into changing their behaviour. I remember watching Zero Carbon protesters at the start of first year shouting about “Corporation Cambridge” and the “marketisation of the university” and dismissing them as too radical. Yet with marketing campaigns like this, making claims about the need to “be bold in pursuing its mission” of contributing to society, it seems that Cambridge has even found a way to marketise the calls for it to change. It is not that Cambridge University should not be marketing, or should be discussing their problems in their pitches for donations. However when they use calls for change in order to solicit those donations it would be less frustrating if there was some meaningful action in tackling these issues, so that Cambridge really can make society better. Who knows, maybe with £2bn in new donations Cambridge will be able to live up to this mission, afford to take a stand by divesting from fossil fuels and arms and pay their workers fairly? There is no doubt that it is up to the elite donors and alumni to make their own mind up about if they would like to give their money to the University. With such a well made marketing campaign I wouldn’t blame them. But I hope they bear a thought for the estimated 85,000 children who have died of malnourishment in Yemen since the Saudi-led coalition launched an air strikes campaign in 2015. Although they deny complicity in reported war crimes in Yemen, BAE Systems signed a deal to provide 72 fighter jets to the Saudis in 2014. The company is listed on the University website as having previously been one of Cambridge’s “industrial partners”. Is this what Toope has in mind when he talks of Cambridge being “a university that does not only reflect the society it serves but one that makes it better”?